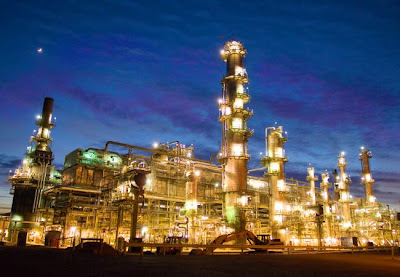 When oil/petroleum refining was first developed, such complicated plants were not needed, and that was probably a great thing as no one would have been able to design such a complex monstrosity a hundred years ago. A distillation column, maybe a tank or two and some simple plumbing would have been enough. The outputs would have been just as crude - a cut for lamp oil, and maybe some gasoline, and then the tar at the bottom was probably just a waste pile until someone figured out that it would be good for roadway surface. But as the demands for these products became more rigorous, the demands on the refinery increased, and so did the equipment. More fractions could be taken, and the fractions needed higher purity. Things like sulfur became a concern, and so removing it required additional processes. Recycle lines were added along the way to increase productivity. The chemical industry was growing and was able to take undesired waste, but only if the waste was of a more consistent output. This continued until we have the huge plants that we see today. Yet at the heart of the plant is still the distillation column. The columns, plants and plant sites are all new, but the thought processes that justified the additional equipment, the history of the refining industry is still there for all to see. As the only chemical engineer that seems to blog on a regular basis, I'd really value your thoughts on the technology contained within a typical refinery. What are they up to in there, anyway (apart from distillation after distillation after distillation)? 90% of petroleum ends up as fuel of some sort - gasoline, heating oil,...It's combusted. The other 10% is split about 50-50 chemicals and then polymers. The fuel group values alkanes, while the second values anything else, since we all know how poor alkanes are for reaction substrates. The petroleum from every well is somewhat different, so a lot of the equipment is available to adjust the feedstock, generally in the direction of lighter grades (low MW). Former petroleum product development engineer here. The modern refinery does a lot of product upgrading - taking low-margin sludge and cracking/hydrotreating/isomerizing it into higher-margin fuels. Much of the technology focus is on better catalysts, but even the tiniest efficiency improvement is very valuable because of the huge scales involved.